Why is MEDca BTE hearing amplification device a must have hearing accessory? The all new MEDca BTE hearing amplifier is one powerful device ideal for those who want to take sound amplification to the next level. The advance microprocessor technology and feedback cancellation feature makes it superior and unique as compared to other existing products. With smaller receiver and partially transparent sleek construction it's a complete package of class and convenience. This amplification device has a full digital circuitry and digital volume control for improved sound quality and precise volume setting. The unit may be small in size but its performance is incomparable. This unique BTE amplifier not only delivers optimal sound but also offers better comfort to the user. It's designed is such a way that it can be adjusted according to the ear size. Most importantly this unit can perfectly fit on everyone. Whether right or left, you can adjust it to either ear. You don't have to be an expert to use our hearing amplifier as it has a very simple interface. For safe and easy storage it comes in a rugged carrying case. 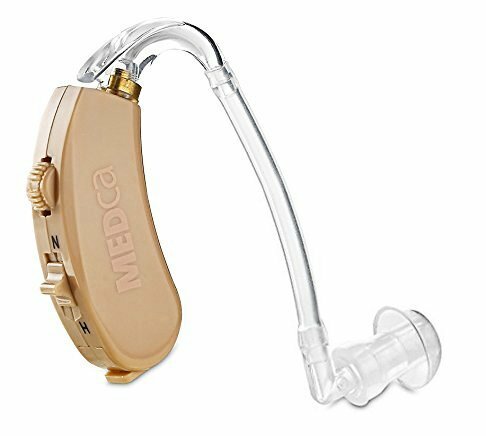 We are offering this powerful MEDca hearing amplification device at a deducted rate for some period of time. Make your purchase before it runs out. To take advantage of this limited offer today, simply click the Add to Cart Button above.